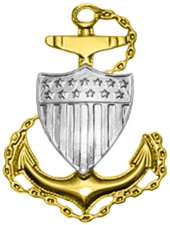 The shoulder sleeve insignia of a U.S. Navy chief Boatswain's Mate with twelve or more years of good conduct. The shoulder sleeve insignia of a U.S. Navy chief Boatswain's Mate, with three red chevrons and one rocker. The collar and cap device of a U.S Coast Guard chief petty officer. Chief Petty Officer (CPO) is the seventh enlisted rate (E-7) in the United States Navy and U.S. Coast Guard, just above petty officer first class and below senior chief petty officer. The rate of chief petty officer is that of a senior non-commissioned officer, and was established on 1 April 1893 for the United States Navy. 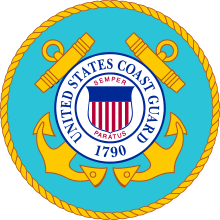 The United States Congress first authorized the Coast Guard to use the promotion to chief petty officer on 18 May 1920. Chief petty officer is also the final cadet rate in the U.S. Naval Sea Cadet Corps. Prior to 1958, chief petty officer was the highest enlisted rank in both the U.S. Navy and U.S. Coast Guard. 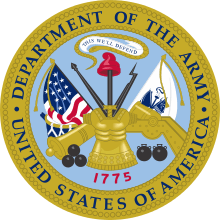 This changed on 20 May 1958 with the passage Public Law 85-422, the Military Pay Act of 1958, which established two new pay grades of E-8 and E-9 in all five branches of the U.S. Armed Forces. In the U.S. Navy and U.S. Coast Guard, the new E-8 pay grade was titled Senior Chief Petty Officer (SCPO) and the new E-9 pay grade as Master Chief Petty Officer (MCPO), with the first selectees promoting to their respective grades in 1959 and 1960. Prior to establishment of the E-8 and E-9 grades, Chief Petty Officers could typically serve in uniform for 30 or more years. 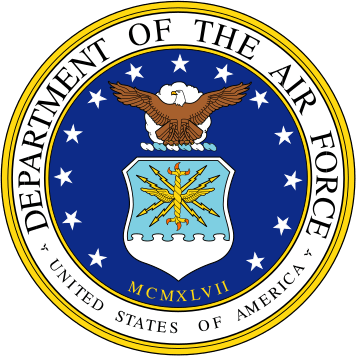 Shortly following establishment of the E-8 and E-9 grades, service limits currently known as High Year Tenure (HYT) were established by pay grade. Although these limits periodically flex based on Fleet manpower requirements, current HYT limits restrict Chief Petty Officers not selected for promotion to Senior Chief Petty Officer to 24 years of service, after which they face mandatory retirement. Similar limits of 26 years for Senior Chief Petty Officers and 30 years for Master Chief Petty Officer are currently used, with a smaller core of Master Chief Petty Officers serving in Command, Force or Fleet Master Chief Petty Officer positions in the Navy and Area or the Coast Guard Reserve Force Master Chief in the Coast Guard, being eligible to remain in uniform for 32 to 35 years and with the Master Chief Petty Officer of the Navy and the Master Chief Petty Officer of the Coast Guard being permitted to remain in uniform until reaching 38 years of service. Navy chief petty officers serve a dual role as both technical experts and as leaders, with the emphasis being more on leadership as they progress through the CPO paygrades. A recognized collateral duty for all Chiefs is the training of newly-commissioned junior officers. 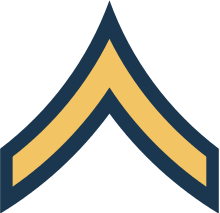 Like petty officers, every chief petty officer has both a rate (unlike the land-centric services, rank only refers to commissioned officers in the U.S. Navy and U.S. Coast Guard) and a rating (i.e., job specialty, similar to an MOS in the U.S. Army or U.S. Marine Corps, or an AFSC in U.S. Air Force). A chief petty officer's full title is a combination of the two. Thus, a chief petty officer who has the rating of gunner's mate would be referred to as a chief gunner's mate. Each rating has an official abbreviation, such as QM for quartermaster, BM for boatswain's mate, or FC for fire controlman. When combined with the petty officer level, this gives the shorthand for the chief's rate, such as BMC for Chief Boatswain's Mate. It is not uncommon practice to refer to the chief by this shorthand in all but the most formal correspondence (such as printing and inscription on awards). Usually Chief Petty Officers are referred to as "chief", regardless of their rating. In the U.S. Navy, both commissioned officers and Chief Petty Officers are often colloquially referred to as "khakis". In the past, commissioned officers and chief petty officers wore khaki-colored uniforms while onboard seagoing vessels, in direct contrast to petty officers and seamen, who were referred to as deckplate sailors, or blueshirts. However, since 2009, while khakis are still worn ashore, the U.S. Navy has begun using a blue and gray camouflage working uniform which replaced the khaki-colored ones worn by commissioned officers and chief petty officers on board ships, and also adopted a new service uniform for petty officers and seamen in pay grades E-6 and below, consisting of a khaki shirt and black trousers. The latter has caused some discontent among some chief petty officers and commissioned officers as a result. In the U.S. Coast Guard, petty officers, chief petty officers, warrant officers, and commissioned officers all wear similar uniforms. Effective immediately, we're respectfully sun-downing the word 'induction', and in its place we'll use CPO 365 as the primary term," said Stevens. "I believe that induction is more about a moment in time, and CPO 365 and the development of our FCPOs to become CPOs is not about a moment in time. It's about a continuous time. This is something we're going to do every day, 365 days a year, and so we want to make sure the term we are using is matching what we are doing. Unlike petty officer first class and lower rates, advancement to chief petty officer not only carries requirements of time in service, superior evaluation scores, and specialty examinations, but also carries an added requirement of peer review. 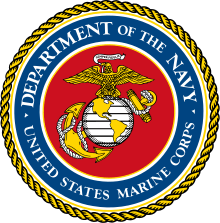 A chief petty officer can only advance after review by a selection board of serving senior and master chief petty officers, in effect "choosing their own" and conversely not choosing others. Advancement into the chief petty officer grades is the most significant promotion within the enlisted naval rates. At the rate of chief petty officer, the sailor takes on more administrative duties. In the U.S. Navy, their uniform changes to reflect this change of duty, becoming identical to that of an officer's uniform except with different insignia. Personnel in the three chief petty officer rates also have conspicuous privileges such as separate dining and living areas. Any naval vessel of sufficient size has a room or rooms that are off-limits to anyone not a chief (including commissioned officers), except by specific invitation. In naval jargon, this room is called the Chief's Mess, or tongue in cheek, the "goat locker". In addition, a chief petty officer is usually addressed by either their rate or as "chief" by both subordinates and superiors upon advancement to the rate. In naval terminology, the deckplate can roughly refer to the deck ("flooring"), or the area of the deck of a ship or boat (submarine). It can also refer to the Division Officer and chief petty officer leadership. The term deckplate leaders is a colloquial term referring to the senior enlisted personnel of the rate of chief petty officer and higher. They are generally charged with keeping good order and discipline within the lower enlisted rates. 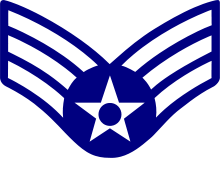 A chief petty officer's rate insignia is a perched eagle with spread wings (often affectionately referred to as a "crow") above three chevrons topped by a rocker. 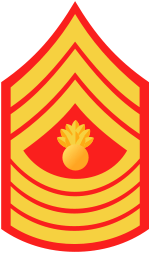 These are red, but if a U.S. Navy chief petty officer has at least 12 consecutive years of good conduct service in the armed forces, the chevrons and rocker may be worn in gold. 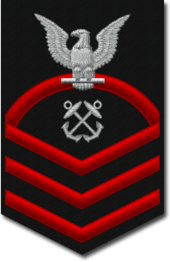 A U.S. Coast Guard chief petty officer's sleeve insignia is always gold regardless of the conduct of service. 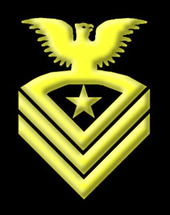 In either case, a chief petty officer's particular rating emblem is displayed below the crow, within the area bordered by the rocker and the uppermost chevron. 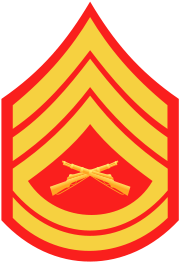 On the dress blue uniform (and variants such as mess whites), the insignia is worn on the left arm of the uniform blouse (or "suit coat" in civilian terminology). 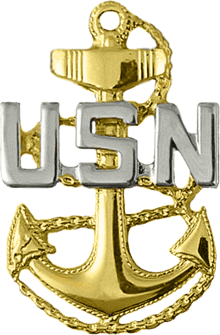 On all other uniforms, the insignia used is worn on the collar and has become universally accepted as the symbol of the chief petty officer, which is a fouled (entwined in the anchor chain) gold anchor superimposed with the letters "USN" in silver in the Navy, or a silver shield in the Coast Guard. Unity: to symbolize "cooperation, maintaining harmony and continuity of purpose and action." Service: to symbolize service "to our God, our fellow man and our Navy." Navigation: "to keep ourselves on a true course so that we may walk upright before God and man in our transactions with all mankind, but especially with our fellow Chiefs." A U.S. Coast Guard chief petty officer's rate emblem is symbolized by a fouled anchor with a shield superimposed on its shank. The anchor is emblematic of "the chief" and represents stability and security. It serves to remind the chief petty officer of their responsibility to keep those they serve safe from harm's way. The significance of the shield date to the days of the Revenue Cutter Service when Congress added the shield to the ensign of the Cutter Service to distinguish cutters from other naval vessels. The chain is symbolic of flexibility and strength and serves to remind the chief petty officer that the chain of life is forged day-by-day, link-by-link. The chain also represents the reliance of one chief petty officer on another to get the job done and reminds him not to be the weak link in the chain. The chain fouled around the anchor represents "the Sailor's disgrace" and serves to remind chief petty officers that there may be times when circumstances are beyond their control in the performance of their duty, but a chief petty officer must complete the task. ↑ Master chief petty officer of the Navy (SW/FMF) Joe R. Campa Jr. (30 March 2007). 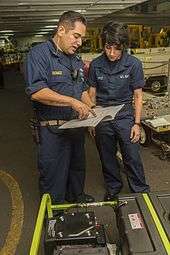 "MCPON Reflects on 114 Years of Deckplate Leadership". Retrieved 2008-05-10. ...commemorating the establishment of the rate of chief petty officer (CPO) in 1893. ↑ "The Drawn Cutlass: New U.S. Navy Enlisted Khaki Uniforms: My Opinion". Thedrawncutlass.blogspot.com. 2008-09-01. Retrieved 2010-10-16. ↑ "Archived copy". Archived from the original on 2012-03-26. Retrieved 2012-01-06. ↑ The Chief Petty Officer's Guide / John Hagan and Jack Leahy. Naval Institute Press, 2004. ISBN 1-59114-459-0. 1 2 "Welcome to the Goatlocker". Goatlocker.org. Retrieved 2010-10-16.